My fourth child started middle school recently, and since I’ve clearly been through this before, I had few worries and anxieties about it. I know that in the span of just three years he’ll greatly mature both socially and physically, and he’ll be challenged in ways and with interpersonal scenarios that elementary school simply can’t offer. I know that middle school isn’t something to fear and lose sleep over, and watching our once dependent children morph into independent ‘tweens’ is something to embrace and be excited about. And yet…. And yet by the second week of school, he was a sobbing mess every evening. Was he being bullied by bigger kids? Nope. Did someone in his class make fun of him in front of his peers? No. Was the switching of classes and new teachers the problem? Nope, not that either. So what was it that had this happy 11 year old in tears? Now I don’t normally freak out about excessive amounts of homework, and I know that the jump to middle school also means a jump in homework, but when I sat down to see exactly what the homework was, that’s when a small jolt of shock hit me. He had assignments to complete in every single subject, and with such variety, detail, and complexity, I had to do a double take to make sure this was not homework for the sophomore class, but for the 6th grade. What is beginning to happen in our middle schools has already toxically permeated our elementary and high schools, but middle school (not unlike the middle child), has contentedly remained ignored (and immune somewhat) to the overachievement insanity that has taken hold of the other schools. We know that Kindergarten these days is the 2nd grade of old, where five year olds are showing up writing in cursive and reading Harry Potter. And if your third grader can’t recite 200 digits of Pi, and name every country (and its capital) in the United Nations, then they’re already behind the ball. 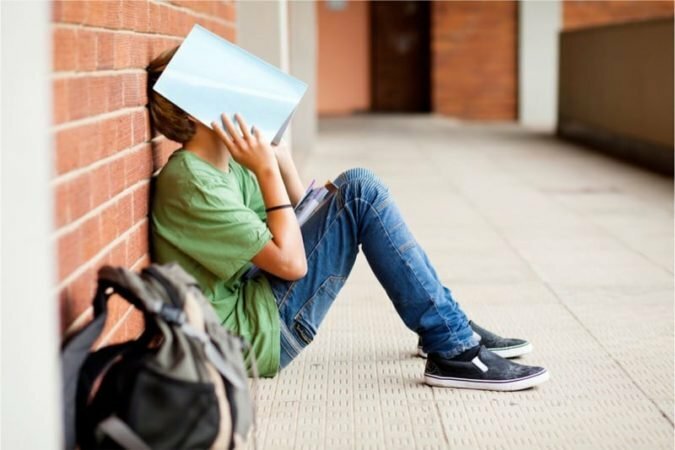 We know that high school academic pressures have reached dangerous levels, and are sending record numbers of teenagers into depression, as well as suffering with anxiety over the fear of failure, and the inability to keep up with unattainable standards that both high school and colleges now require of them. The problem is spilling over onto college campuses– whose mental health centers are so inundated with students, many are developing new interventions and trainings solely for their freshman, who are coming to college already burned out just from high school. And now this insanity has reached middle school, where once joyful fifth graders who loved to learn are not only walking into a brand new “social” environment they have to navigate, they’re being told on day one that if they’re not seriously and 100% properly prepared for high school (which we now plan on banging into their heads daily during grades 6-8) well, then they can just forget about college, which means they’ll never reach any level of success whatsoever because college is the only path to success. And now, evidently that path starts in 6th grade, where the option to enroll in high school classes even exists at this point. STOP. PLEASE STOP. I fear this trickle down effect (or up, as is the case with Kindergarten) of increased academic pressures at such young and impressionable ages and grades not only does little to foster a desire for lifelong learning, it actually reverses it. We think we’ve been doing the smart thing by slowly nudging our children for years to be brighter and smarter at younger and younger ages, and all we’ve done is create a generation of students that are so stressed out, they’re actually experiencing delayed maturation, and unable to function and do even the simplest of “adulting” tasks when they actually reach college. And why is that? Their carefree childhood is essentially stopping at middle school, and with it, so are several years worth of childhood experiences that collectively mold and shape children into mentally healthy and functioning young adults. In a word, in an attempt to make them brilliant superhuman adults, we’re asking them to do superhuman things at ages where they’re simply not capable of doing it. And to add insult to the ridiculousness of molecular biology in the 6th grade, is the fact we’re also crushing their spirit in the process. It’s not in any way, shape, or form normal for 11 year old 6th graders to cry for two hours on a weeknight over homework. Let me repeat that, IT IS NOT NORMAL. I’m not sure what the effect of this will have. Well, let me take that back. I know exactly what the effects of this will have. Google “college mental health centers” in the “news” category. There are your effects. Scary, isn’t it?